There are often varying reasons for skin irritations. Some of our customers have had lifelong issues with sensitive skin including redness, dryness or itching. Additionally, some people also have known skin conditions such as eczema, dermatitis or psoriasis. From a nutritional therapy perspective, we would suggest looking at your essential fatty acid intake in the first instance as many of us have low levels. Try increasing your weekly consumption of smaller oily fish such as mackerel, sardines, anchovies and salmon. Alternatively, you could opt for a fish oil capsule supplement. These essential fats can really help as they are anti-inflammatory and provide moisture to the skin. Additionally, taking a daily probiotic in supplement form can be useful as it will help support the immune system from the inside. We don’t generally advise people to cut out whole food groups as we should be eating a broad range of foods as part of a healthy, balanced diet. However, for those with sensitive skin conditions, dairy can be inflammatory. You could try an alternative milk source such as sheep or goat’s milk to see if that helps. Additionally, having a diet that is too rich in red meat consumption can also have a negative impact on the skin. Eating foods such as sweet potatoes, butternut squash, avocado (which is full of vitamin E) plus your green, leafy vegetables and small fruits such as blueberries, raspberries and redcurrants can be particularly beneficial. They are alkalising, anti-inflammatory and are also rich in antioxidants and anthocyanins which help to protect your skin. Nuts and seeds are really good to include too as they are also full of those essential fats. If you are keen to identify what your sensitive skin trigger is, try keeping a daily food diary for a month. Consider how your skin looks and feels each day. Taking weekly photographs of your skin can also be helpful. You can mark those out of 10 depending on how irritated, dry, red or itchy your skin feels that day. If you feel you may have identified a problematic food, it’s worth taking it out of your diet for a week or two. Ensure you are properly taking the food out, however, by checking labelling for hidden ingredients. Skin sensitivity could also be a sign of a food intolerance, for example, having too much wheat in your diet could be an issue. People do notice a difference in their skin when they eliminate a problem food for a short period. Another aspect to consider is what you are using on your skin in terms of skincare and bodycare products. Ingredients used in household cleaning products such as hand wash, shower gel, shampoo, washing up liquid and washing powder can also lead to skin irritation. When customers have changed to using natural and organic skincare products they have noticed a significant improvement in their skin. Key ingredients to avoid are parabens and sodium lauryl sulphate (SLS). 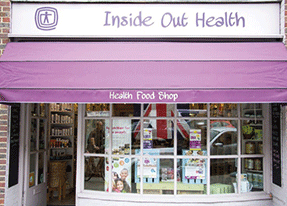 Kate took over as owner of Inside Out Health in December 2011. The store’s team are all qualified nutritional therapists and are registered with the British Association for Applied Nutrition and Nutritional Therapy (BANT). They offer advice in store and via private consultations. The store stocks a wide selection of practitioner level supplements from ranges such as Viridian, Terranova, A.Vogel, Biocare, Lamberts and Nutri Advanced. In addition, there is a good range of organic and natural food, free-from options and organic skincare from brands such as A’kin, Lavera and Sukin.